A fascinating, well-researched, reasonably-argued article at a top video games site argues that it is time for the Major League Players’ Association to forget if not forgive the last “replacement players” from the 1994-95 forced strike, and grant them participation in the union’s merchandising plan, and allow them, finally, to be simulated in the top baseball video games. I’m not a gamer, so I can’t speak to how disturbing it has been to have tried to maintain the simulation experience without Brendan Donnelly, Matt Herges, Ron Mahay, Kevin Millar, and Jamie Walker. But having covered the nuclear labor winter of fifteen years ago, I can’t agree with absolving the real-life guys of the responsibility they have for the choices they made in the spring of 1995. Although replacement players receive pension benefits, are subject to the same rules of free agency and are given representation during salary arbitration, disciplinary hearings or other matters, they are barred from joining the union, cannot vote on its matters and, of course, can’t collect any licensing money. In other words, despite taking the most serious action a potential member could take against his striking/frozen would-be teammates, the players who went to the awful “Replacement Spring” of 1995 get the full benefits of the union they were willing to undermine. 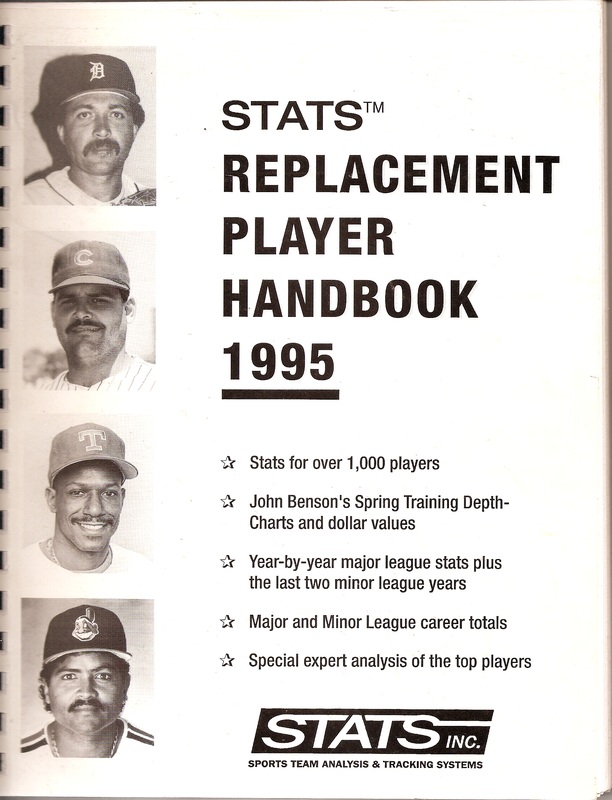 They just don’t get some of the ancillary perks, like the simulated doppelgangers and the real money they create (one will note there is no shortage of baseball cards of replacement guys – and not just the Millars, but also the Donnellys and Herges… Hergeses… Hergeseses… guys named Herges). No matter what you think of unions, and particularly of the irresponsibility of this union in the steroid era (to say nothing of its short-sightedness in that mid-free agent era in which a little fiscal responsibility might have led to more teams with more jobs for more union members), the punishment seems limited and symbolic enough. It is hard now to remember what February and March of 1995 looked like. In short, the owners were one good court ruling away from getting the right to impose whatever rules they wanted despite their own shared culpability in the end of the ’94 season. They could have broken the union and buried any players who didn’t cooperate. They didn’t get the court ruling, and had to settle with the players and to instantly sweep away the post-apocalyptic scene that was unfolding in Florida and Arizona. The Replacement Jays were particularly pathetic. Other clubs might have been looked a little more professional, but that was sad in its own way. Pedro Borbon, Sr., was pitching for the Reds – at the age of 48. Oil Can Boyd, just 35, was thought to be the ace of the White Sox staff. Rick Reed, later to succeed for the Twins and Mets, was considered the likeliest Cy Young candidate. There were the human interest stories: the Yankees had at least one guy in camp who was, literally, a UPS driver. And these were just the guys we knew of: washed up ex-big leaguers looking for one last taste of glory, career minor leaguers seeing this as the big break they’d been denied, and the kids like Millar, 23 years old and having shown very little promise in A-ball the year before, who were probably just too scared to say “no” when somebody in management said that his decision would be remembered even when all of this replacement stuff had been forgotten. The problem is, hundreds of Millars still said “no.” They may indeed have been punished later for refusing to fill out a uniform during those dark weeks of Replacement Ball. There is nobody to argue for some recognition for their less obvious sacrifices. Millar, Donnelly, and the rest, were – for whatever reason – willing to accept this nightmarish farce, to provide backbone in that parallel universe where 1995 saw the World Champion Dunedin Jays, and NL MVP Jeff Stone of the Phillies, and fireman of the year, 40-year old, five years removed from his last big league pitch, Willie Hernandez of the Yankees. They made a choice. The punishment was more symbolic than vengeful. Besides, if you feel your video game is incomplete without Brendan Donnelly, you may be a little too into video games. FROM A RESEARCHER’S NOTEBOOK: On Opening Day of the 1967 season, there were 17 pitchers named “Jim” on major league rosters. Six of them: Jim Grant, Jim Kaat, Jim Merritt, Jim Ollom, Jim Perry, and Jim Roland, were with the Minnesota Twins. Remarkably, the Twins had six pitchers named Jim, and only five pitchers not named Jim. This is not a knock against Derek Jeter, who has been a credit to his franchise and the game since 1995, and who has never been anything but courteous and professional in his dealings with me (and everybody else I knew). This is not, in fact, about Jeter. But I wish there would be a little more emphasis of the caveat in all of the discussion of Jeter’s having reached within four hits of breaking Lou Gehrig’s Yankees franchise record of 2,721, that Gehrig stopped accumulating them when he was 35 years old, because he contracted a fatal disease that would claim his life. I made this point years ago, as Cal Ripken approached Gehrig’s consecutive games played streak. It needs to be said again that Gehrig didn’t stop because of loss of talent, or retirement, or failure. And most remarkably of all, it should be emphasized that at least the last 174 of Gehrig’s hits (just as was the case for at least the last 165 of his games played), certainly came after Amyotrophic Lateral Sclerosis had already begun to kill him. Again, nothing to take away from Jeter’s accomplishments. Just a reminder of the remarkable quality of Gehrig’s, and that as time guarantees that his name will become harder and harder to find in the record books, he should never be forgotten.